From left, Dr. Prab Tumpati, Dr. Deepak Shrivastava, Dr. Bharat Bhushan, Dr. Umakant Khatwa, Dr. Anuj Chandra, Dr. Suresh Kotagal, Dr. Bindu Kutty, Dr Narender Kumar, Dr. Saraswati Muppana, Dr Sharon Keenan and Dr. Raina Gupta. 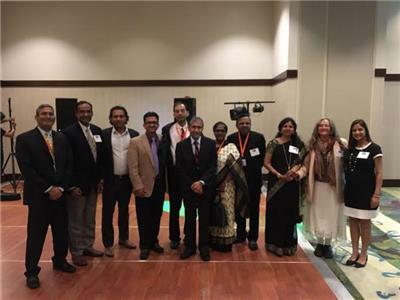 The American Association of Physicians of Indian Origin – Sleep was formed six years ago to act as a forum to exchange ideas and improve the awareness of sleep disorders in the United States and India. The organization initially focused on the Asian-Indian population because OSA affects the South Asian population at a similar rate to the U.S. despite lower rates of obesity. There are also close to a thousand physicians of Indian origin who practice Sleep Medicine in the United States. “We must dispel the myth of Obstructive Sleep Apnea being a malady exclusive to patients with the classic build—obese with a large collar size,” says Dr. Anuj Chandra, who has served as president of the American Association of Physicians of Indian Origin – Sleep for the past three years. AAPIOS celebrated its 6th annual dinner conference in Denver on June 12. There were 170 attendees despite many competing events that night. The Keynote Speaker, Dr. Jaspal Singh, led an exciting interactive session: “The Future of Sleep Medicine from a Business Perspective.” The presentation addressed telemedicine and how gadgets already being utilized by patients may provide additional clinical information. A Lifetime Achievement Award was presented by Dr. Teofilo Lee-Chiong to Dr. Suresh Kotagal from Mayo Clinic for his significant contributions to sleep medicine. Dr. Narendra Kumar presented an Academic Excellence Award to Dr. Bindu Kutty from NIMHANS, Bangalore India. The Outstanding Research Award was given to Dr. Sachin Relia from the Cleveland Clinic for Depression Score Changes in Response to Sleep Disordered Breathing Treatment with CPAP in a Large Clinic Based Cohort. Also present were Dr. Atul Malhotra, Dr. Naresh Punjabi, Dr. Sudhanshu Chokroverty, Dr. Neal Friedman and Dr. Sharon Keenan form the School of Sleep Medicine at Stanford. For more information, please visit aapios.org.